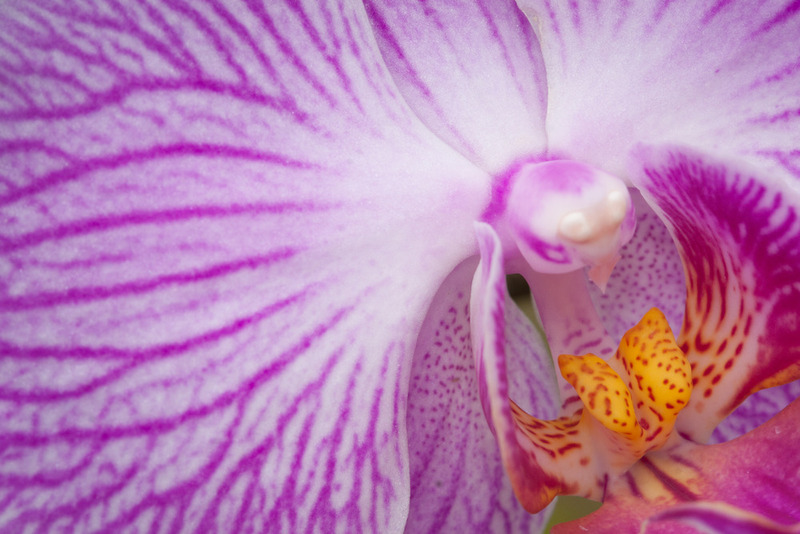 Shooting macro closeups of orchids and camellias indoors is always a sure way to beat the winter blues, at least for a few hours. You can do this at an Arboretum, a Greenhouse, or even at home with store bought potted or cut flowers. Using my 100mm macro lens, I worked to create a slightly different series of images that went beyond a traditional representation of the flowers. What makes this lens special is the 1:1 ratio (pronounced one to one). It allows me to fill the frame with even the tiniest details. Below: A super closeup study of the beautiful Camellia flower. When you are working with this kind of intense magnification, you need a tremendous amount of depth of field to keep things sharp. For this reason, I usually opt for a small aperture. Of course this lets very little light into the camera so a slow shutter speed and tripod are necessary. I also use a hint of fill flash just to soften the shadows a bit. Believe it or not, the pop-up flash on your camera will work just fine for this. Everything was manually focused using the very handy Live View mode. For more on this technique check my video here. This unique little orange orchid really popped against the green foliage which I opted to blur nicely at f8 with the 100mm lens. Don't settle for everything centered like a bullseye. Instead, I recommend approaching the flowers from various angles so you can seek out unique compositions like this white orchid above. By manually focusing in Live View it's possible to micro-focus on even the tiniest of details. Autofocus can work as well, but be sure to use just one active AF point, and place it on the part of the flower you want sharpest. Check all four corners of the viewfinder for distracting elements before taking the shot. Remember to simplify and don't hesitate to get in nice and close!